Suddenly, we are seeing a spate of realistic plots in the movies. Not a trend toward monsters or vampires, but the enemy without and within. This is man vs. man, and the type of character-driven plot that in olden days Burt Lancaster or Jimmy Stewart would have rushed to play. Captain Phillips is everyman. He is Tom Hanks, a hard-working man who is at heart, the quintessential captain willing to give his life for his ship and his men. He is the type of average hero we haven’t seen enough of in recent years on film. His character is the one who is never given enough attention in real life, and is the star of this action film. Tom Hanks’ Captain is the one we would like to think we could be. He is the person who, under duress, becomes a hero. This film celebrates that heroism with a kind of quiet determination not seen in screenplays in recent years. The acting of Tom Hanks is one reason this film works. Someone who overplays the role would not wring the pathos and earnest steadfastness that is central to the Captain’s character. His core beliefs are on display throughout the latter part of this awful journey. And yet, we see him as far more than simply a ship’s captain. He is trying to do the right thing by his men, and yet he displays compassion and practical wisdom that he tries to convey to his captors. Very little of the screen time is spent with the high tech world that is achievable through our modern military. Most of the humanism that is at the core and is central to this plot emanates from Tom Hanks. 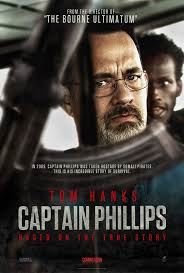 He is the embodiment of the everyman and his Captain Phillips is the one we all want to be. That is the reason the film works as well as it does.